Surrounded by dining powerhouses like Eva, Angelini and BLD, casual Shaky Alibi is a welcome addition to the Beverly Boulevard culinary landscape. The wafflerie and coffee shop is a true local gem, as the owner, R.J. Milano, and his family live close by in the neighborhood. 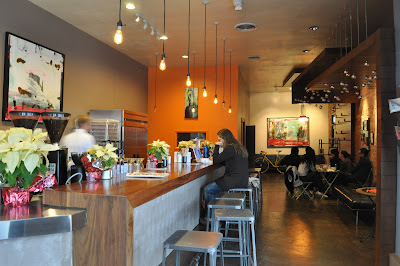 The eatery—which opened last summer—features a chic modern interior with orange accents, Milano’s favorite color. Apart from the coffee bar, a few small tables are the only seating option, so we recommend visiting during off-hours. If you get bored, or decide you need some post-meal physical activity to burn off the calories, there’s a ping pong table in the back! We warmed up with a café au lait and a hot chocolate. Both were carefully crafted and got our stamp of approval. A large selection of teas is available as well. The waffles served here are not the ginormous monsters found at places like Griddle Café, but they are authentic, real-deal Belgian-style treats, which reminded me of the common street food snack I enjoyed while in Brussels a few years back. Made from a family recipe, they’re crisp on the outside, and warm and fluffy on the inside. We started with a traditional sweet Leige style waffle, topped with sprinkled powdered sugar and a traditional Belgian spread called Speculoos. Our photographer, Jen, and I both agreed that it reminded us of childhood for some reason, which we soon realized was because the spread tastes pretty similar to Golden Grahams cereal. Other spreads and fruit and nut toppings are also available. Next we moved onto a savory waffle. Shaky Alibi allows you to customize your waffle with a meat and cheese of your liking. We opted for black forest ham with gruyere, and were quite content with our selections. It’s best to visit with a friend, so you can try both the sweet and savory varieties; both were delectable and it would be hard to pick a favorite. While the establishment’s name continues to confuse us—apparently it has something to do with an experience Milano once had while serving on jury duty—we hope to return to this cozy neighborhood gathering spot often. Shaky Alibi, 7401 Beverly Blvd., Los Angeles, CA 90036, 323.938.5282, www.shakyalibi.com, MAP. NEXT TIME on Foodie Fridays: Who knew The Dime served food? We'll be sampling the creative bar bites at the popular Fairfax watering hole. omg i love shaky alibi! well i've always loved liege waffles, but now liege with speeculoos or liege with ham and cheese- heaven! So glad you wrote this - I always pass this place and wonder what it's about. 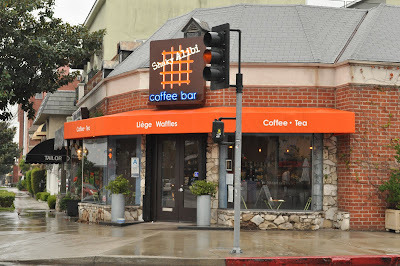 Mark and I are always on the lookout for coffee shops, and this one looks really cute. Plus, that savory waffle looks amazing. i'm going today! golden graham waffle...can't wait!